Dr.Ajay Vasant founder of Astrouniverse.com and Research Scientist, WISE (USA) is a Holistic Healer and an international speaker.His field of expertise includes Acupressure, Acupuncture, Mudra therapy, Healing, Hypnotherapy and Medical Astrology.He firmly believes one can attain self realization only through ancient science and his goal is to unify ancient science with modern science in the hope of benefiting humankind and alleviating their sufferings. During one of his visit to Mantralaya in 2002, Dr.Ajay was initiated and blessed by a saint and was asked to take up the service of promoting holistic science wholeheartedly.Since then, he is promoting holistic science as a service to humanity. Dr.Ajay Vasant, a Chemical Engineering graduate and a MD in Acupuncture has done research in Holistic science for 10 years and designed "AHAM" therapy, a therapy which when followed gives complete solution for all physical, emotional and mental issues by balancing the Chakras. 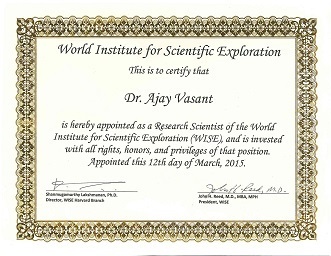 As a result to his astounding research in the field of Alternative Medicine, he is appointed as Research Scientist for World Institute for Scientific Exploration, USA by the Director of WISE Dr.Shanmugamurthy Lakshmanan, a Harvard Research Scientist and President Dr.John Reed. 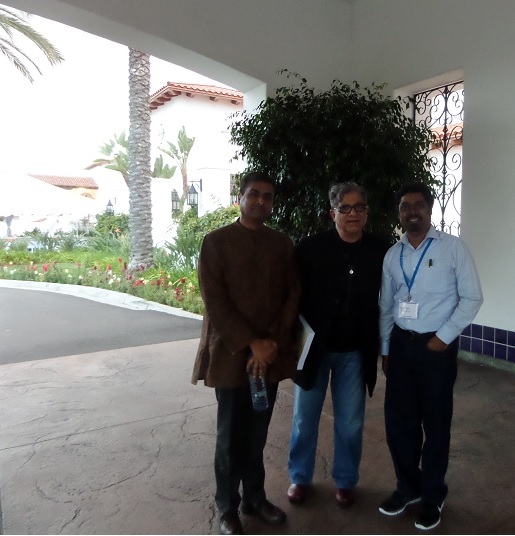 He has participated in the workshops of Worlds leading experts in the field of mind body healing like Dr.Deepak Chopra's "Journey into Healing" which is affiliated to the San Diego School of Medicine, CA and Dr.Martha Lucas "MeiZen Cosmetic Acupuncture" at Minnesota, MN. A Mind & Body Healer & a Wellness Guru is a member of various institutions like Reiki Center of India, Sujok International and All India Alternative Medical Academy. He conducts workshop on holistic science throughout the globe and writes for several websites on articles related to holistic healing and occult science. Some of the seminars which he participated in India and abroad includes International Astrological Conference held in Delhi in March 2007, HOLICON 2010, Hyderabad, HOLICON 2011, Salem, Tamil Nadu and World Congress meet in Colombo during 2010 and 2011. His tendency in serving people has made him devote his positive energies mainly towards consultation and healing. He is in the Advisory Committee of "Udavikkaram Association for the Welfare of Physically Disabled and DARE, an initiative taken by Udavikkaram in association with EXNORA,Chennai.He is also the Managing Trustee of "Universal Foundation", a social organisation which aims to promote education, job opportunities among the poor and disabled.It also focus on promoting the awareness on drugless therapy and provides life enrichment services for senior citizens. 1. "Best Scientific Astrologer" award on 26th October 2003 from Tamil Nadu Cinema Kalai Manram, Chennai. 2. "Siddhar Karuvurar" award on 06th January 2012 from Mrs.Gokula Indira, Honourable minister of Tamil Nadu. 3. "Best Alternative Medical Practitioner" award on 01st of October 2012 by "All India Siddha Doctor's Association". 4. "Best Social Service Award" on 22nd December 2012 from Mrs.Valarmathi, Honourable Social Welfare Minister of Tamil Nadu. 5. "Vocational Excellence Award" in the field of Social Service by Rotary Club of Poovirinthavalli.